The RSS has hit upon a winning formula - push the Hindu Rashtra agenda through its elected political puppet. The “new normal” is the latest buzzword that defines a changing world getting accustomed to disturbing developments and a disquieting emerging order. It signifies a palpable lowering of the political discourse, but more worryingly, new societal trends in human behaviour that have upended traditional norms of democratic debate, civil liberties, and a pluralistic community structure. As India’s mainstream media remained pathologically obsessed with the unfortunate and untimely death of famous Bollywood actress Sridevi, a highly stunning statement from RSS chief Mohan Bhagwat went largely unnoticed. A new normal definition did not need a more appropriate manifestation. 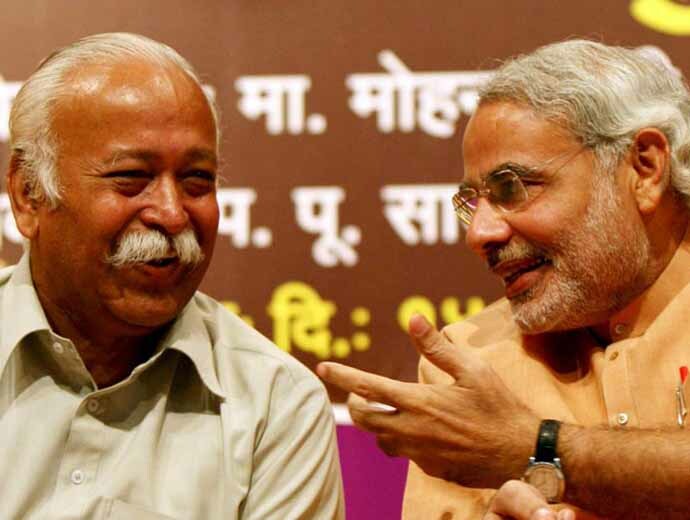 Bhagwat’s controversial utterances would have a few years ago (before Narendra Modi became prime minister) resulted in mast-head coverage and several prime-time debates. Now, it did not even get a cursory mention. A repeated barrage of such deliberate instigation invariably reduces the human mind into a state of languidness, a torpor. Few protest, some believe these are momentary outbursts to be casually dismissed, while the majority end up believing that there must be substantive material in that argument to deserve such repeated homecomings. A new paradigm is established. The bar is lowered. Suddenly Bhagwat’s call for a Hindu Rashtra (which stands against the very principles of the Indian Constitution) is treated with kid-gloves. Some even argue; so what’s the big deal? The psychological brainwashing of the Orwellian 1984 variety seems uncannily close. Bhagwat called for all Hindus to be united, but more disconcertingly, said that the entire Indian society should join his Rashtriya Swayamsevak Sangh. The RSS is ostensibly a social-cultural organisation, but it has covert political intentions, for which it has a surrogate entity spearheading its cause, the Bharatiya Janata Party. It is an unbreakable umbilical cord; those who believe the RSS is just the ideological mentors of the BJP miss the woods for the trees. The RSS has hit upon a winning formula; push the Hindu Rashtra agenda through its elected political puppet, while ensuring that it takes a moral high ground behind the artifice of being a nationalistic entity promoting majoritarian interests and cultural hegemony. Despite the several duplicitous deals of the BJP, corruption scandals, sleazy allegations of immoral conduct and criminal charges against its members and leaders, the RSS is kept at an arm’s length. It speaks thus from a highly protected bastion; it can do no wrong, even as its communally poisonous Hindutva project marches remorselessly forward under the painstaking guidance of India’s self-styled "pradhan sevak". Modi, a former RSS pracharak, cunningly floats rumours through his propaganda machine, that he is often hamstrung from pursuing India’s larger egalitarian goals because of the Nagpur bully. It is total bunkum. The RSS and the BJP are two sides of the same counterfeit coin, their adroit deceit being cleverly camouflaged. The RSS provides its organisational apparatus, including foot-soldiers to do door-to-door campaigning during election time. They do TV shows together; each ensconced in each other’s reassuring warm hugs. The RSS-BJP is a formidable political calculus. India underestimates the dangers of this carcinogenic machine at its own peril. Not long ago, in a flagrant attempt to accentuate religious polarisation, Bhagwat had also said that all Muslims living in India (approximately 170 million) are also Hindus. It was meant to infuriate hardline, similarly fundamentalist among the Muslim leadership to indulge in an equally trenchant, vituperative rebuttal. That suits the Sangh Parivar, as minority hate-speeches receive wider amplification through a servile, domesticated print and electronic media. Then the troll army that specialises in morphed images, fake news and post-truth takes on sinister proportions through a WhatsApp tornado. India’s democracy is vulnerable today, as the majority of the impressionable youth are easily susceptible to a pernicious propaganda. The whole cashless, digital footprint, internet and mobile-driven government policies that we have seen is more about giving Modi/BJP an image of modern-age technologically savvy development avatar; this provides buffer against the frequent criticism of them as a party that practices a cryto-fascist ideology and ethnic chauvinism, whose sole aim is to take India fast forward into the dark ages. It keeps the population bewildered. It suits the BJP. As an electoral strategy it has worked wonderfully for them, as Modi continues to prosper despite his inherent communal predilections coming in full display during the Uttar Pradesh and Gujarat elections. He has even survived a repugnant, reprehensible assault on several luminaries, including former PM Manmohan Singh, for virtually labelling them as anti-nationals. Modi’s patently false jibes on Pandit Jawaharlal Nehru in Parliament itself demonstrated the new age of alternative facts; bludgeoning the truth is now not a happenstance; it’s political strategy. A new normal thus insulates even a prime minister making absurd, defamatory accusations. Soon, everything is forgotten. Some call it politainment. But India is being gradually, systematically wrecked, and the majority of Indians have no idea of what is going on. It is this new normal that permits Mohan Bhagwat to make that outlandish statement of unhinged braggadocio; "RSS can prepare an Army in three days, unlike the Indian Army that would take six months". That’s why currently for the Sangh Parivar, it is strawberry fields forever. But this new normal is coming at a huge price; the idea of India hangs in a precarious balance. For every true liberal in India, the detoxification of its democracy is the real challenge. The countdown has begun. There is no time to waste. Also read: Why must we label Sridevi — the star — a lonely, unhappy woman?